The game begins with a randomly generated maze with the player in the top left and the monster in the bottom right. The objective is to stay alive until the time runs out. If the player stays still, their health falls rapidly, so keep moving (Never Stop Moving). The monster is hunting the player and constantly moving towards them and unfortunately for the player... the monster is pretty fast. 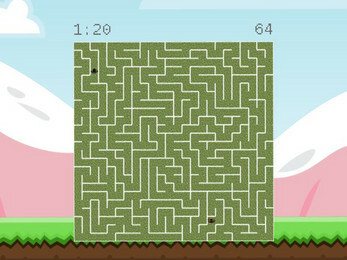 At any time, the player can regenerate the maze but it comes with with a cost against the player's health. If you run out of health or run into the monster, you lose. Stay alive and win! The source is available on my Github. Download the zip file and extract. Double click the Run Barb, Run! batch file to play.